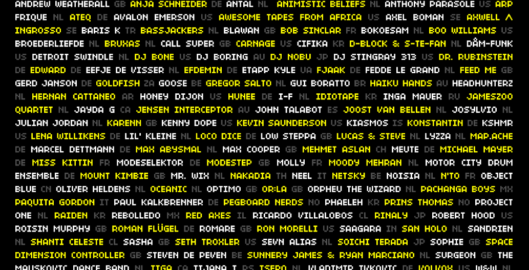 The Amsterdam Dance Event (ADE), the world’s largest festival and the most important global business conference for electronic music, announced its second selection of artists today. Among them are Amelie Lens (BE), Axwell /\ Ingrosso (SE), Broederliefde (NL), CIFIKA (KR), Kiasmos (IS), Oliver Heldens (NL), Ricardo Villalobos (CL) and Sasha (UK). 808 State (UK), ACE1 (JP), Adam Beyer (SE), Agar Agar (FR), Agoria (FR), Amelie Lens (BE), Amy Root (NL), Anna (BR), Andrew Weatherall (UK), Anja Schneider (DE), Antal (NL), Animistic Beliefs (NL), Anthony Parasole (US), Arp Frique (NL), ATEQ (DE), Avalon Emerson (US), Awesome Tapes From Africa (US), Axel Boman (SE), Axwell /\ Ingrosso (SE), Baris K (TR), Bassjackers (NL), Blawan (UK), Bob Sinclar (FR), Bokoesam (NL), Boo Williams (US), Broederliefde (NL), Bruxas (NL), Call Super (UK), Carnage (US), CIFIKA (KR), D-Block & S-Te-Fan (NL), Dâm-Funk (US), Detroit Swindle (NL), DJ Bone (US), Dj Boring (AU), DJ Nobu (JP), DJ Stingray 313 (US), Dr. Rubinstein (DE), Edward (DE), Eefje de Visser (NL), Efdemin (DE), Etapp Kyle (UA) FJAAK (DE), Fedde Le Grand (NL), Feed Me (UK), Gerd Janson (DE), GoldFish (ZA), GOOSE (BE), Gregor Salto (NL), Gui Boratto (BR), Haiku Hands (AU), Headhunterz (NL), Hernan Cattaneo (AR), Honey Dijon (US), Hunee (DE), I-F (NL), Idiotape (KR), Inga Mauer (RU), Jameszoo Quartet (NL), Jayda G (CA), Jensen Interceptor (AU), John Talabot (ES), Joost van Bellen (NL), Josylvio (NL), Julian Jordan (NL), Karenn (UK), Kenny Dope (US), Kevin Saunderson (US), Kiasmos (IS), Konstantin (DE), KSHMR (US), Lena Willikens (DE), Lil’ Kleine (NL), Loco Dice (DE), Low Steppa (UK), Lucas & Steve (NL), Lyzza (NL), Map.ache (DE), Marcel Dettmann (DE), Max Abysmal (NL), Max Cooper (UK), Mehmet Aslan (CH), MEUTE (DE), Michael Mayer (DE), Miss Kittin (FR), Modeselektor (DE), Modestep (UK), Molly (FR), Moody Mehran (NL), Motor City Drum Ensemble (DE), Mount Kimbie (UK), Mr. Wix (NL), Nakadia (TH), Neel (IT), Netsky (BE), Noisia (NL), N’to (FR), OBJECT BLUE (CN), Oliver Heldens (NL), Oceanic (NL), Optimo (UK), Or:la (UK), Orpheu The Wizard (NL), Pachanga Boys (MX), Paquita Gordon (IT), Paul Kalkbrenner (DE), Pegboard Nerds (NO), Phaeleh (KR), Prins Thomas (NO), Project One (NL), Raiden (KR), Rebolledo (MX), Red Axes (IL), Ricardo Villalobos (CL), Rinaly (JP), Robert Hood (US), Roisin Murphy (UK), Roman Flügel (DE), Romare (UK), Ron Morelli (US), Saagara (IN), San Holo (NL), Sandrien (NL), Shanti Celeste (CL), Sasha (UK), Seth Troxler (US), Sevn Alias (NL), Soichi Terada (JP), SOPHIE (UK), Space Dimension Controller (UK), Steven de Peven (BE), Sunnery James & Ryan Marciano (NL), Surgeon (UK), The Mauskovic Dance Band (NL), Tiga (CA), Tijana T (RS), Tsepo (NL), Vladimir Ivkovic (DE), Volvox (US), W&W (NL), Wildstylez (NL), Woody’92 (NL), Yallah! Yallah! (NL), Yellow Claw (NL) & Zip (DE). The Amsterdam Dance Event is organized by Stichting Amsterdam Dance Event, an initiative of Buma.